With summer officially here, it’s a good time to enjoy the outdoors and take in the extra hours of sunlight. 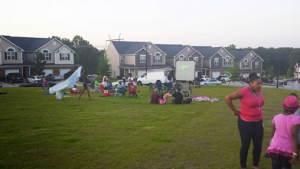 With that in mind, Fred Smith community residents should definitely keep an eye out for upcoming outdoor movie nights. 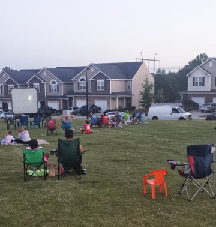 If you happen to live in Knightdale’s Mingo Creek community, you may have had the chance to enjoy last week’s movie which featured Oz: The Great and Powerful. How Was Mingo Creek’s Movie Night? A success! Overall, more than fifty people came out to see a showing of Oz: The Great and Powerful last Friday evening. 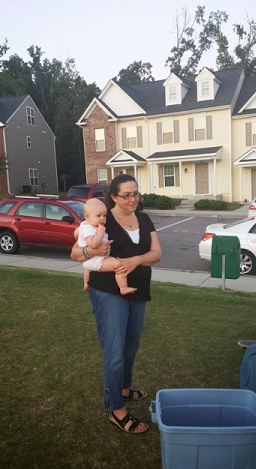 Take a look at the pictures below to see families enjoying some cool drinks and the sunset presentation. And you might even be able to spot your friends and family, too! If you were in attendance, tell us what you thought about the movie event in the comments section at the bottom. Where: Tralee residents in Wilson’s Mill can look forward to an upcoming movie night at the Clubhouse on 110 Tralee Drive. When: June 28 (this Friday) at 8:30 p.m.
What Movie: Rise of the Guardians. Movie Info: This animated film follows the adventures of the Guardians, who must stop an evil force from taking over the world. Rise of the Guardians has been rated PG. What Else: There will be cold drinks available at the clubhouse.